The Souss Valley is one of Morocco’s most fertile regions. It was half waterlogged as I free-wheeled passed fields of olive, orange and argan trees. And there was I thinking that water shortage was an issue in Morocco . I arrived in Taroudande in record time, having cycled 107km in just over 4 hours. Impressive average I thought, but then I had descended 800 metres in altitude. 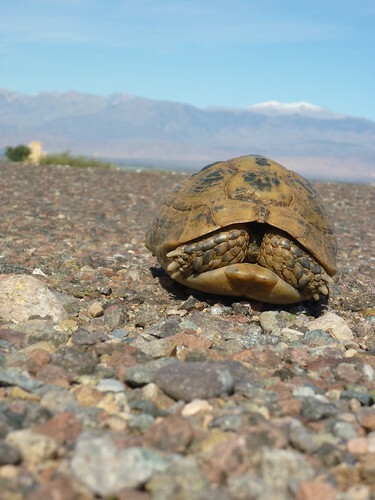 Only a camera-shy tortoise that appeared to be sleeping in the middle of the road provided cause for a serious stop. Inside the red-walled medina the bustle of traffic and people came as a small shock after the previous several weeks in the mountains. I soon found the central hub and checked into a hotel that seemed to be run by two old women. They spent the entire time cleaning and were quick to point out that I would not be taking my bike into the room. Several hours later another cyclist arrived. He appeared to have trouble understanding where he should put his bike so I attempted to translate, in Japanese. I’d already heard about Jimbo, or Hiromu-san as I called him, from Ian. Having quit his job as a travel agent he started his journey in Istanbul last May. The plan is to cycle around the World for 5 years. It was pure chance that we met. His route is also to head south through western Africa. 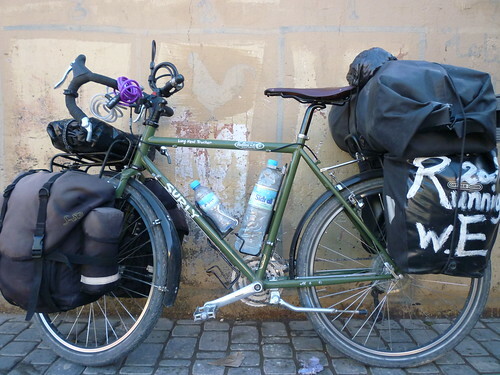 There is no website, just a bike and heavily-laden panniers with the words ‘Running with Emily’ written across them. Emily, (Emire I think) it turns out is Hiromu-san’s girlfriend. How kawaii I remarked. Leave your girlfriend for 5 years to cycle around the World and dedicate the name of the trip to her. I haven’t spoken Japanese in over a year, but the words came back to me surprisingly quickly. Hiromu-san’s English is typically Japanese (he’s studied it for years but needs much conversational practice) so I feel less embarrassed in making lots of mistakes and it’s much easier, if far less useful at the moment, than French. It was interesting to see Hiromu-san’s ‘Plan of the World Round Journey’ – an ambitious list of about 70 countries enclosed with a letter to explain his purpose. All very Japanese. I suggested he join me on the road south, although he already had a Mauritanian visa and I still needed to journey up to Rabat and visit the embassy. Before all that however my focus was on reaching the coast. 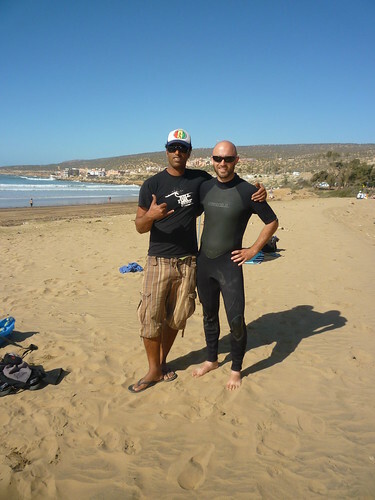 About a month ago I was contacted by someone who runs a surfing hostel. “We have a friend who follows your website. If you’re passing through come and stay”. Why not I thought. Tamraght is to surfers what Toubkal is to trekkers. The locals call it Banana village for the surrounding plantations. It’s not a pretty town. Unfinished breeze-block buildings sprawl over the rocky slopes that rise inland from the sea. It’s prime real estate land though. 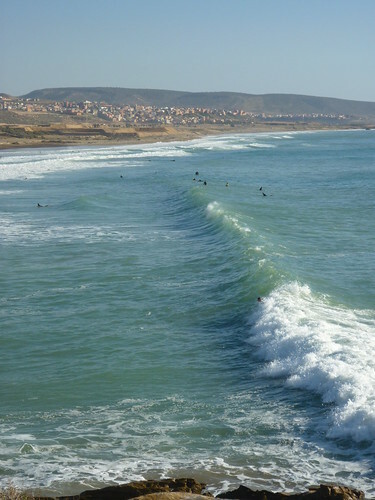 The coast north of Agadir has some of the best surf in Morocco. 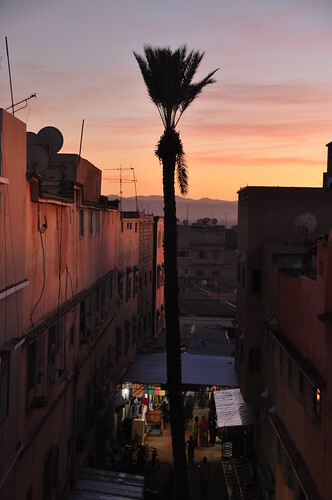 Most of the foreigners who come to this part of Morocco live for just that. The swell here can be strong. I spent most of my first attempt at trying to surf by fighting the current, whilst kids of about 12 were happily paddling beyond the 3 metre breakers. 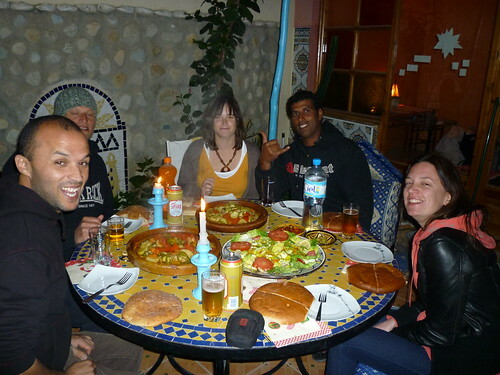 Jalal, who runs the hostel gave me some instruction so I tried again the next day and was marginally better. On the third attempt I was nursing a hangover from the night before. Not a bad way to spend New Years Day, but my ribs were hurting from lying on the board. My German/Arabic companions on New Year’s Eve were ready to sleep long before midnight. Hiromu-san had by this stage departed, but I’m hoping we’ll meet further south in Morocco or Mauritania. I recorded these videos as he was leaving. I’m starting to read your blog again. I’m glad you changed the format back to the old one.